▲ The teams enter the stadium. Photo courtesy Jeju Special Self-Governing Province. Jeju recorded its best ever perfor-mance at the the 95th National Sports Festival which closed in Jeju City on Nov. 3. The province finished 11th in the medal table, with Gyeonggi Province taking top spot. The event was the biggest ever national sports festival, which has been held in some form since 1920, with a total of 32,510 attendees including 18,769 athletes with representatives from 17 provinces and cities, five North Korean provinces and overseas Koreans. 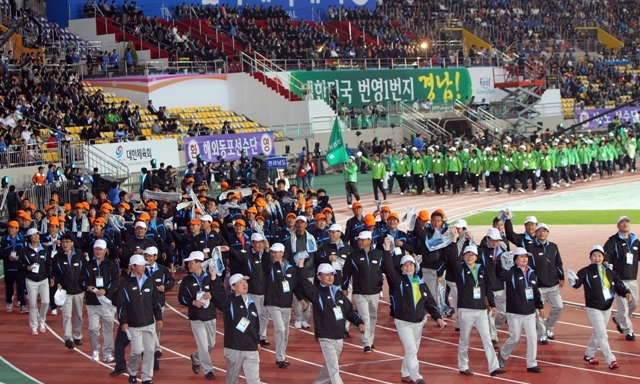 A total of 117 world, national and games records were smashed in the process as 47 events were held across seven days at venues from Pyoseon and Gujwa to Hallim and Daejeong, and many more. Jeju finished the tournament with 167 medals (52 golds, 54 silvers and 61 bronze) leaving the small island province 11th overall on 31,861 points. The province’s previous best performance was 157 medals, 30,000 points and 12th place in the standings in 1998, the last time home ground advantage was enjoyed. If gold medals alone are considered, Jeju stood ninth overall from 17 provincial and municipal teams. The Jeju team walked away with one new Korean record, four games records, and tied one world record. Most of the golds came in weightlifting (14), taekwondo (six), swimming (six), judo (four), dance sports (three) and wrestling (three). In other years Jeju, the least populated of Korean provinces, has habitually finished in last place in the standings. However, with the addition of Sejong City in 2012, Jeju has been 16th of 17. The provincial team had set a target of 12th this year, but reaching 11th is vindication for the two years of investment in facilities and nurturing of athletes since 2012. Gyeonggi Province (60,807 points) took first place for the 13th consecutive event with Seoul in second (48,707). “The hot flame of the torch is now out and people must return to their everyday lives. Let’s all put our attention now towards Gangwondo,” where the festival will be held in 2015. ▲ Two of the many staff, volunteers and athletes who numbered over 32,000. Photo courtesy Jeju Special Self-Governing Province. There were also records elsewhere at the festival as archer Kim Woo-jin, Cheongju, set two world records and was awarded tournament MVP, beating swimmer Park Tae-hwan, Incheon, into second in a reporters’ vote. Archer Kim scored 352 points from 36 shots in the 70-meter recurve, two more than the previous world best, on Oct. 29. He then scored 1,391 points the next day, beating his own four-year-old record of 1,387 for the combined points score from the 30 m, 50 m, 70 m, and 90 m.
A total of 18 Korean records were set at the event, which was won by Gyeonggi Province for the 13th straight year with 121 golds, 96 silvers and 118 bronzes. Second and third were taken by South and North Gyeongsang provinces, respectively. The games torch is now making its way toward Gangneung, Gangwon Province, for next year’s festival.